The majority of pool tables come as standard with a 48-inch cue (which is considered to be medium size). 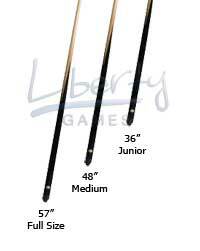 A 57-inch cue is considered full size and for tight cueing areas or junior players a 36-inch cue is also available. Pool cue tend to have wider tip diameters in comparison to their Snooker counterparts. What type of table is best for me?